Performance: 400 pulses per revolution. Dimensions: the encoder body size: | O~; 38mm; shaft &O-;6 x 13mm; axis platform: high-5mm &Oslash; 20 mm; fixing holes: M3 screws, three mounting holes round of 30, three mounting holes in round 28; side of the outlet. Wiring: Vcc positive supply, 0V to A-phase, B-phase, shielded cable. <div>&nbsp; &nbsp;Performance: 400 pulses per revolution. 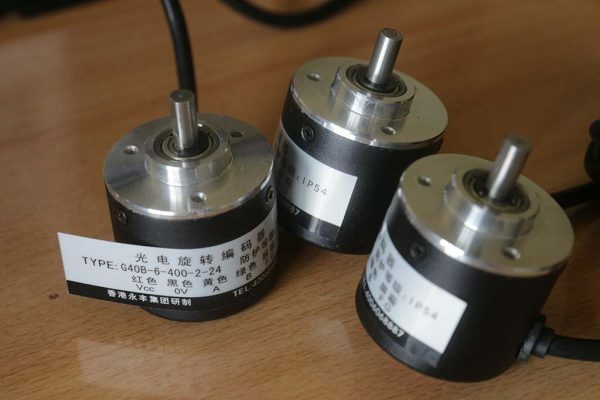 Working voltage :5-24V, maximum mechanical speed of 1000 rev / minute Dimensions: the encoder body size: | &Otilde; 38mm; shaft &Oslash;6 x 13mm; axis platform: high-5mm &Oslash; 20 mm; fixing holes: M3 screws, three mounting holes round of 30, three mounting holes in round 28; side of the outlet. Note: AB two-phase outputs must not be connected directly to the power supply VCC, otherwise, they will burn the output transistor. Posted on 05/07/2016 by admin. This entry was posted in sensor. Bookmark the permalink.